Tanata Productions specializes in transforming your media into portable experiences that travel the world. In museums all around the world of all shapes and sizes, we have worked with clients to intelligently simplify their media packages into travel-worthy exhibitions. We have extensive experience editing, encoding, formatting and translating your media into cost-effective playback solutions. Finding your story and bringing it to new audiences is at our core. Whether it's a new message or transformative narration, let us help you bring it to life. When MoMath Museum in New York City approached Three Byte Intermedia about creating an engaging interactive Robot Swarm, a wonderful story started to unfold. Combining technology with a youthful point of view, Tanata Productions set out to illustrate how solving simple ideas requires a great deal of ingenuity and a child-like fascination to make it all come together. Animating the Everyday, created by South African artist Robin Rhode, was presented at the Neuberger Museum of Art at SUNY Purchase College from May 4 through August 10, 2014. Incorporating digital work that spanned a ten-year period of the artist's career, Robin's use of alternating projections and large sweeping surfaces challenged us to find a centralized content management solution that fit the Neuberger's unique space and budget. The award-winning Stepping Stones Museum in Norwalk, Connecticut asked us to produce an engaging testimonial video to highlight their volunteer program for the annual fundraising presentation to donors and benefactors. In order to strategically develop what would be an effective, imaginative and illustrative video marketing presentation, we spent three months working with the executive management team at Stepping Stones Museum. We handled all of the aspects of content production and editorial, including format conversion, encoding and delivery. 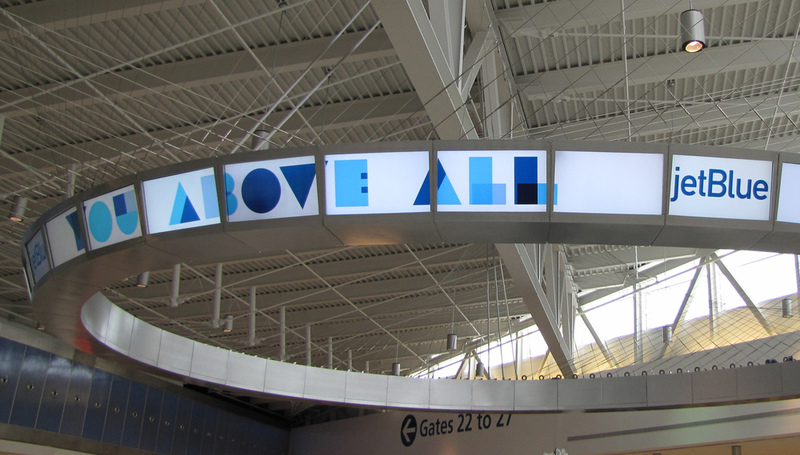 Jet Blue's primary message board is a giant video ring that lives above the entrance to Terminal 5 in John F. Kennedy airport. Tanata Productions maintains the 24/7 content implementation, and coordinates special events and new promotional material. All of this is managed remotely and can be updated instantaneously. American artist Tom Christopher invites us to take little trips with him around New York, and we go along for the ride. Creating narrative and visuals on the fly, Tom's unique view of the art world leave us with a deeper understanding of the everyday strokes that make up his paintings. Three Byte Intermedia created an interactive radio lobby for Clear Channel. Liora Manne hired us to put together a promotional video for their custom tapestries. Morris Media's new digital properties were eager to introduce their brand of New England living. We designed the content creation, programming and implementation for a 3-screen electronic signage installation in the Millstein Properties Liberty Luxe / Liberty Green promotional lobby. The promotional video for EV3's reality television series, Crush Hill. The introduction video for Interep Media's Mobile Entertainment Symposium. The launch video for Mobile ESPN'S Sports Heaven, a promotion for their new mobile service introduced during Superbowl XL.